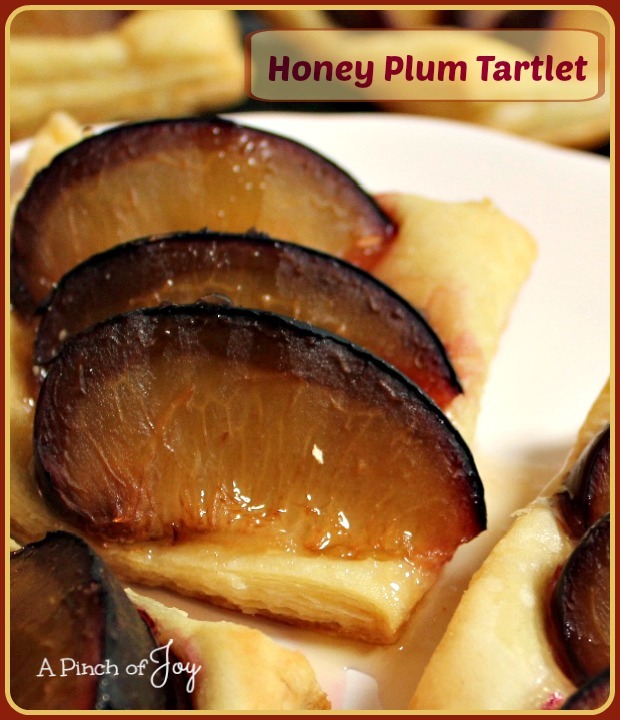 Honey Plum Tartlets – Quick, easy, three ingredients, looks fabulous, and tastes as good as it looks! Just the right size for a touch of sweetness after a good meal. At our house, plums are a seasonal thing. Wheels loves to eat them out of hand, but there are always two or three left setting in the bowl for several days. This is a good way to use those last fruits of the season. If you want a crispy pastry, prick each square several times with a fork before arranging the plums. I like puffy, crispy flakiness so I just leave them. For guests, a little “real” whipped cream on the side or a small scoop of very good vanilla ice cream is wonderful. Quick, easy, three ingredients, looks fabulous, and tastes as good as it looks! Just the right size for a touch of sweetness after a good meal. Cut thawed pastry into six 4” squares and place on parchment paper lined baking sheet. Slice plums about ½” thick and arrange on pastry. Bake for 25-30 minutes until pastry is golden brown. Remove from oven. While still hot, drizzle about half a teaspoon of honey over the plums in each pastry. Can be made a few hours in advance, but best eaten the same day.